Waste paper and clay mixed together produces a beautiful and ethnic looking pulp known as paper mache. Toys from paper mache are well made in Jaipur by the artists who craft animals and birds in an attractive blend of colours and artistic imaginatation. 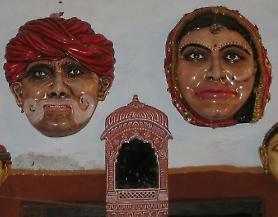 Artists at Palai in Tonk make beautiful paper mache furniture. Banasthali is known for its attractive multipurpose bowls. Paper mache has found a place in the commercial market and variety of products are made out of it and exported.